This post is a counterpoint to my last, on Edgware town centre, and its Portas Pilot. These two outer north-west London town centres do form a nice counterpoint for me, as I live between them, a mile south of Edgware and a mile north of Kingsbury. 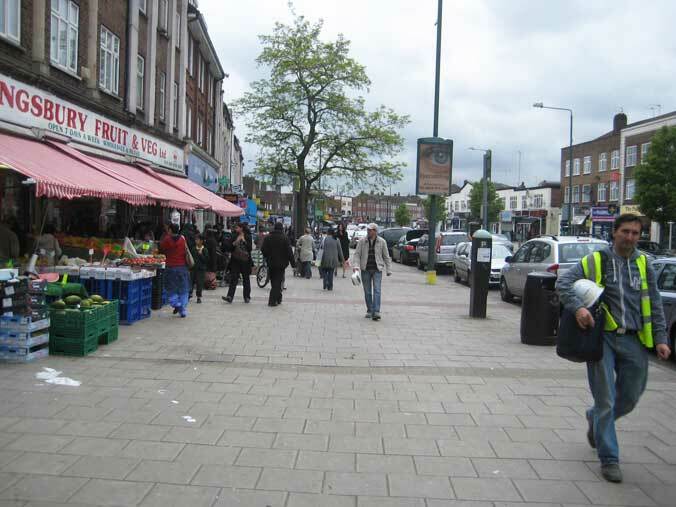 Kingsbury and Edgware town centres have many similarities. They are both centres of 1930s suburbs where people live mostly in detached and semi-detached houses. They both have tube stations (but Kingsbury has no bus station, and rather fewer buses). They both consist essentially of a single main shopping street, which is also an important through-road (in Kingsbury, the A4006 Kingsbury Road, which links the A5 to Harrow). They both have considerable off-street parking provision, as well as parking on the main road and side roads. But while Edgware town centre is considered to be doing sufficiently poorly to require a bid to the government's "Portas fund" to revive it (what anybody thinks this £80,000 odd will achieve I am not sure), Kingsbury town centre has one of the lowest vacancy rates in the country at only 1.1% empty shops, and appears to be prospering. So I think people looking at centres that are doing less well, like Edgware, rather than producing a lot of opinions about what is wrong with them and what needs doing, that may or may not have much basis in fact, should look at what is right, very near by, in Kingsbury, and why that centre is doing comparatively well. Here are what I think are some of the important things that are right in Kingsbury town centre, that are differences with Edgware: you will see that my focus is on street design and the environment. The shops in Kingsbury are really rather functional: food shops, banks, travel shops, Asian sweet shops, Asian clothes shops, and cheap hardware shops are noticeable. There is nothing particularly chic and nothing conspicuously "smart" about Kingsbury town centre. There are some pubs and restaurants, but no "café culture". The pavements in Kingsbury Road are extremely wide. The original service roads in the 1930s street design have been filled in, with either pavement, or segregated cycle track, on the stretch to the east of the tube station. These wide pavements allow the shops to spill out onto the street, while still allowing ample space for pedestrians to circulate and meet, and there is plenty of room for the street furniture and street trees. The road is narrowed by the parking down to one narrowish lane in either direction, and, east of the shopping centre, by Roe Green Park, where parking does not have this effect, the council (Brent) narrowed the previously four-lane road to two lanes using islands and central hatching, so controlling the speed at which vehicles enter the shopping stretch. (This was a highly controversial move locally, introduced by the previous Lib Dem–Conservative coalition administration). Vehicle speeds on Kingsbury Road are now mostly quote moderate. The road has been supplied with crossings at good intervals, and at these points, the road has been narrowed further. (As these narrowings just replace the parking, cyclists are not presented with a sudden constriction in the road at these places – though cycling conditions are not particularly good.) The crossings are one stage for pedestrains (c. f. the staggered "pig-pen" crossings of Edgware's Station Road), and the green man appears very fast – five to ten seconds after the button is pushed. The side-road crossings of the footway are good. They are kept narrow, with a tight geometry, and the carriageway has been raised to pavement height, which is very convenient for the disabled. 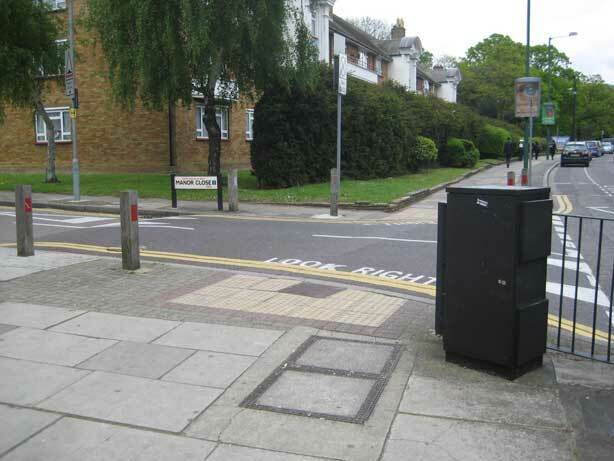 Give-way chevrons have been painted to the side-road side of these speed tables, obliging motorists to give way to pedestrians. 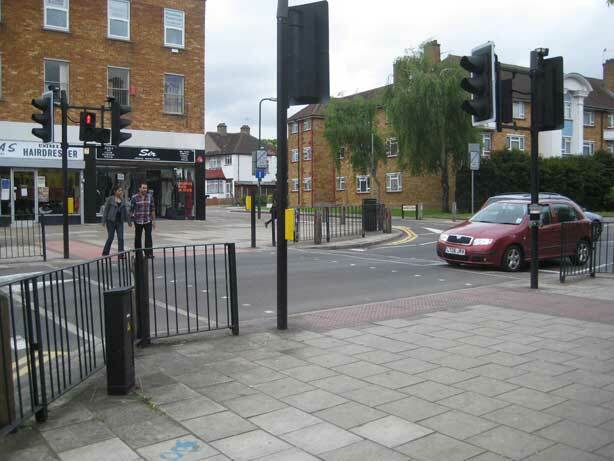 These junctions contrast with the flared, two-branched side road junctions that Barnet Council has favoured in Station Road, Edgware. Those give priority and space to cars, these give priority and space to pedestrians. 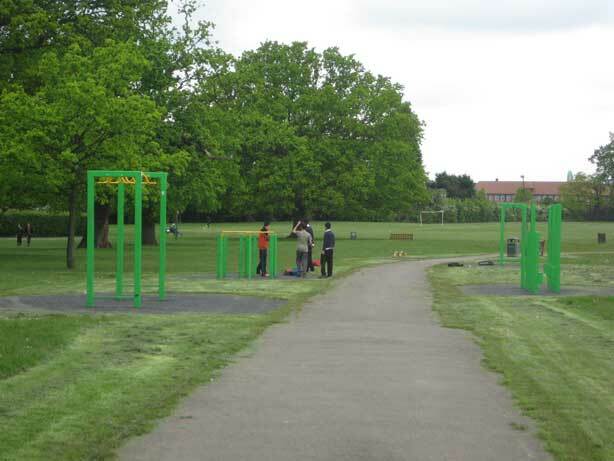 There is a large and pleasant open space on the north side of Kingsbury Road, Roe Green Park, which is well-supplied with activities for both children and young people. 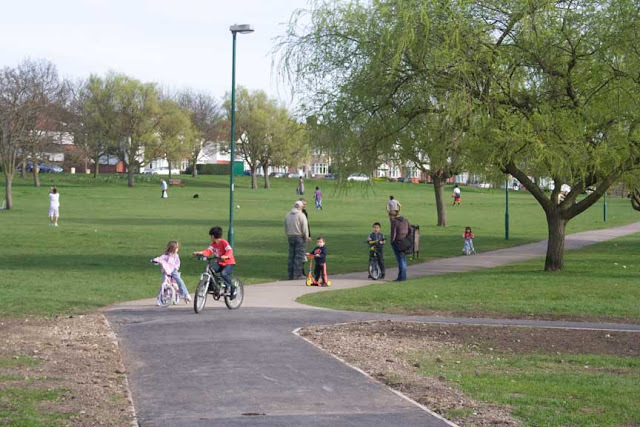 The park is a combination of playing fields, playgrounds, and planted garden areas. Brent has not cut back on the maintenance of its open spaces to the extent that Barnet has (though the swimming pool that was promised for Roe Green Park was cancelled as part of the current budget cuts). There are several schools around the park, including the very large secondary Kingsbury High School, and, via the park, a lot of young people are naturally conducted to Kingsbury Road, adding to its level of activity. 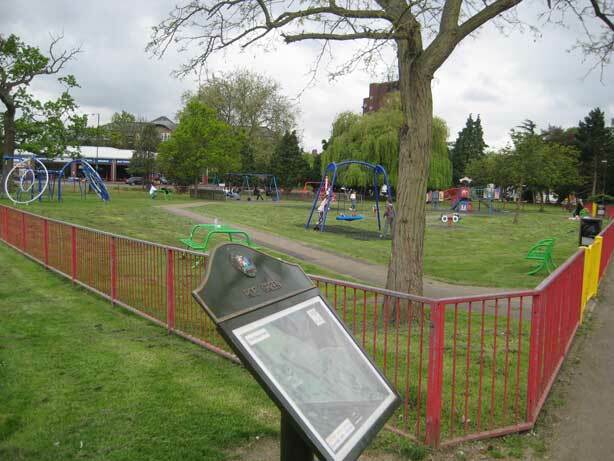 Play equipment for older children in Roe Green Park, with Kingsbury High School in the background. There is some prominent cycle infrastructure in Kingsbury Road. I have discussed this provision before, in one of my earliest posts in this blog, just about a year ago. 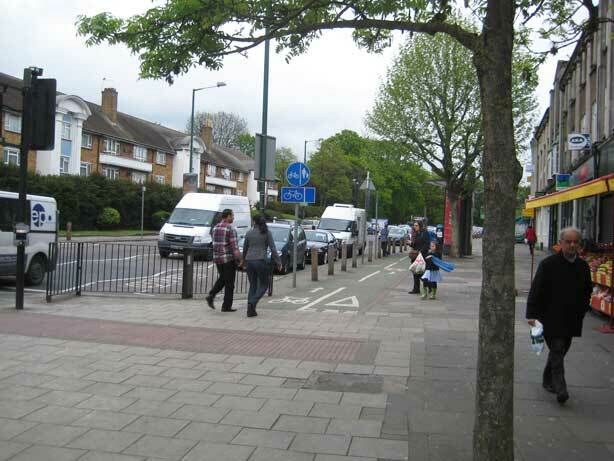 It is not very good, because it is not coherent (like most UK cycle infrastructure). A two-way cycle track, that was taken out of the huge pavement space on the south side of the road, goes along for a distance west of Roe Green Park at footway level, generally walked upon by pedestrians, before terminating illogically at a Toucan crossing, where the route turns into advisory cycle lanes on both sides of the road, painted in the "door zone" of parked cars. On the westbound side, the route goes on to the pavement again, west of the tube station, this time between the road and service road, to terminate at a zebra crossing of the A4140 Fryent Way, where cyclists I presume are expected to dismount, as cycling on a zebra crossing is illegal. In Kingsbury, in addition, there is useful cycling, for both children and adults, on the paths in Roe Green Park, allowing them to access the town centre and the too-brief two-way track. Though all cycling is actually against Brent's parks by-laws (dating from 1906! ), the Parks Department do not enforce this ban (as they have few staff to do so, and no interest in doing so provided no nuisance is being caused), and in fact some paths in Roe Green Park are marked as permitted routes on Transport for London's Cycle Guide 3. The most important differences between Kingsbury town centre and Edgware town centre are, however, I think, the following. Kingsbury has no large supermarket. It only has small and medium-sized shops. Generally, the major chains are conspicuous in Kingsbury by their absence. There is a smallish Boots the Chemist, and a Tesco Local was built recently by Kingsbury Circle, on the site of a pub (pubs have been decimated in north-west London in recent years). Shopping in Edgware is dominated by the Sainsbury's in the Broadwalk covered shopping centre, with its massive car parks both at ground level and on the roof of the centre. Kingsbury has nothing like the Broadwalk Centre, packed full of chain stores, including Sainsburys and M&S, the only businesses usually that can afford the rents in such places. Kingsbury has an off-street car park, but a relatively small and hidden one with narrow access, not one that motorists are obviously directed into, and it has about the same amount of on-street parking as Edgware. In Edgware, the Broadwalk Centre has drained the life away from Station Road and the High Street, many shoppers arriving at its easy-to-use car park, walking straight into the centre, and not venturing further. Similar has not happened in Kingsbury. The high-capacity motor vehicle access provided to the Broadwalk Centre car park has made Edgware's Station Road far less walkable. Planning and design decisions taken for Kingsbury Road have kept it walkable. There is also no equivalent of the A5 Edgware Road in Kingsbury severing the shopping area into two parts. The two centres look architecturally different, mainly because Edgware in blighted by the cheaply-thrown up Premier House office block and other pieces of nondescripness, while Kingsbury retains a certain uniformity and low-key dignity with its redbrick with cement decoration 1930s shopping parades, never rising above three stories. Kingsbury had lower pretensions than Edgware to start with, and has never been treated as a major centre, so has been spared out-of-scale developments. Or, perhaps, Brent Council has prevented them. The new flats above the Tesco are the worst example in Kingsbury, at six stories high. There are things that are not great about Kingsbury Road, apart from the incoherent cycle route. The new Tesco Metro, with its own car park between the pavement and the store, causing a lot of vehicle movements across the footway, was a retrograde planning step. The maintenance of the service road on the south side between the station and Kingsbury Circle is hard to explain. That should have been done away with, along with the rest of the service roads, to increase pavement space there as well. Most importantly, Kingsbury Circle is a very dangerous obstacle for cycling, a poorly-designed multi-lane roundabout with five wide geometry exits. As a fast and experienced cyclist I can negotiate it, but a lady cyclist I know, who goes everywhere locally on her bike, will not do so, but crosses the roads as a pedestrian, and I can fully understand this. It is certainly not negotiable by children and novices. Some will no doubt point to the unpopular method of charging for on-street parking introduced by Brian Coleman in Barnet as being a factor in Edgware's problems. Coleman got rid of the ticket machines and made people pay using mobile phones. But I don't see how this can be particularly relevant, as, if you look at the on-street parking in Kingsbury and Edgware, you see it is mostly occupied during shopping hours in both places. And it is also obvious, looking at the numbers of people shopping in Kingsbury Road, that most of them cannot have cars parked on the street. Broadly, I think what the comparison between Kingsbury and Edgware town centres shows us is that car parking is not the issue. The issue is design and planning that emphasises and strengthens the social function of the street and makes it easy to use by those on foot and bicycle (though the latter are a tiny minority here). This goes with maintaining a sensible scale of development, and keeping activity on the street by not setting-up an alternative indoor focus that is most easily accessed by car. People do not now need to go to shops at all if they don't wish to, and all shops are feeling this effect. But they still need public spaces to serve a social function, and where this happens, the businesses around benefit. Many of the right planning decisions have been taken by Brent Council at Kingsbury, and it is quite apparent looking at the scene in Kingsbury Road that the street is serving a strong social function, despite the still quite considerable volume of motor traffic passing through. It's not a quaint picture-postcard scene; it's not a historic town square. It's plain, suburban, and middle class. But it's also varied, cosmopolitan, busy and active, and it works quite well. Those towns and suburbs with failing centres, take note. More parking and glitzy, covered shopping malls are not what you need. I know not the tax structure of the UK, but in the US (New Jersey in particular) reliance on the property tax to fund local functions led to a chasing of money-makers called "ratables", which begat the "More parking and glitzy, covered shopping malls [and big box stores too]..." that blight town centers. How does Kingsbury finance itself and make it possible to keep a human-scale mindset? Property taxes and business rates are a much less important source of finance for local authorities in the UK because of the centralisation of our whole government funding system. Local authorities only raise 10–20% of their own funding, and are dependent on a central government grant for the rest of it. The good thing about this arrangement is that it evens out disparities between the funding of rich and poor areas. The bad thing is that it undermines local democracy. I think it would be better if local government in the UK raised more of its own revenue. Having said that, there is a strong driver for local authorities to accept plans for big developments that are not wanted by local people, in terms of a kind of bribe that developers are legally allowed to pay the authority, an up-front sum known as "section 106 money" from a clause in an act of parliament. I think in the case of Kingsbury it has just not been seen as an important enough place to attract interest – as a centre within the Borough of Brent, it is very subsidiary to Wembley, where the council is based, and which is having massive development at the moment. Kingsbury is a rather overlooked place generally. My partner has pointed out that I omitted to mention that there is a superstore at Queensbury, only 3/4 mile up the road from Kingsbury Circle. We have a two or three-tier local democracy system, depending on whether you live in an urban or suburban/rural setting. So for example in my case we have the local parish or town council, the borough council, which covers three small towns, and finally the county. Most public services are managed by the second and third, with county being responsible for schools and roads as perhaps its most widely used services, and borough being responsible for libraries, refuse collection/recycling, and off-street parking. County, being responsible for roads, is also responsible for on-street parking. Both county and borough have to manage their parking in terms of restrictions in place or time, charging, and enforcement action, and both as a result have revenues from parking and expense for enforcement. I am sure it would make a lot more sense if all parking was handled by a single authority, and furthermore by the authority which has to deal with the consequences of unlimited parking, ie the pressure on roads. That would be county, which also seems to have entered the 21st century where modes of payment are concerned – they are looking at mobile-phone payment and other modes, while borough is just coin-op, no change given. As it is, there is a conflict between the two providers in that county’s omission so far to charge for on-street must deny revenues to borough, as well as clogging up streets around the shops and station, much to the annoyance of the people who live on those streets. But then enter a county proposal to introduce a range of new parking restrictions on residential streets, together with an element of charging which is cheaper compared with town centre off-street but more expensive compared with station off-street, and all hell breaks loose. The county has been forced to retreat and lick its wounds, although I am assured by my local councillor that they will be back. Perhaps the only benefit of the whole exercise was that the councillor, who happens also to be the cabinet member for roads, has put his officers to work on surveying for cycle parking to make the town centre a more attractive cycling destination – the local roads environment is already quite sympathetic, more by chance than design, you just need somewhere secure when you get there. Shortly afterwards, the borough increased off-street charges to around 80p per hour. One of the loudest, most persistent, and falsest accusations made by protesters is that this is just another tax, money to go into the council’s coffers to be wasted on councillors’ expenses, LGBT liaison groups or traveller stopping sites (yes, we have all those prejudices as well). In fact, parking charge money is ring fenced, I am not sure whether it is to provision and maintenance of car parking and enforcement, or to a slightly wider roads maintenance object. The county unquestionably loses money on parking due to enforcement costs which it has inherited from the police. I don’t know about the borough, except that my own guesstimate of a popular town centre car park, right next to Waitrose, suggests that the returns actually derived, compared with the development value of the site and the returns a landlord would expect from such value, is truly pathetic. You mention section 106 money, but I am not sure just how beneficial that is to the local authority. From my reading of planning applications in the City of London, while the s106 payment is compulsory and is determined from the scale of the development envisaged (presumably £X per square metre, depending on the type of development), the developer can heavily influence how the money is spent, and can in effect force it to be spent on projects which appear to have public benefit but in reality only benefit the immediate and direct environment of the development itself, and then only in terms of what the developer believes to be beneficial.